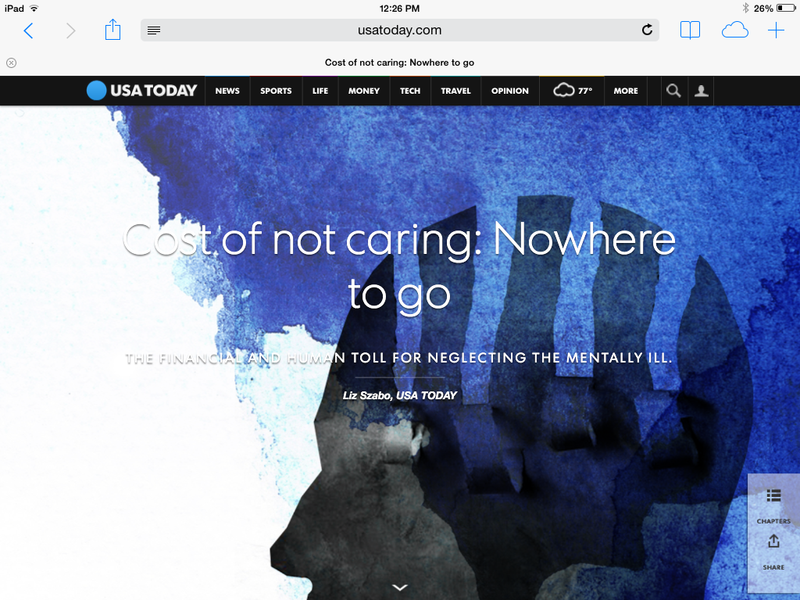 I intended to pull some juicy bits from USA Today’s currently running series on mental health in America, “The Cost of Not Caring: The Financial and Human Toll For Neglecting The Mentally Ill,” write them into a pithy post, and provide a link to the series. Alas, my page of notes became pages of notes and would constitute a post of themselves. Say what you will about USA Today (referred to as a “McNewspaper” when it first began publishing), this series is well-researched, attractively presented, and important to see in a mainstream publication. I could tell my less liberal, less intellectual friends to read an important piece on mental health in the New York Times and hear the crickets through the cable coming to my house. Tell them to read this piece in USA Today, and I believe a lot more will do just that. Part 1, Nowhere to Go, details how half a million Americans with “serious mental illness are falling through the cracks of a system in tatters,” landing in emergency rooms, jails, and homeless shelters, on the streets or dead. I recall passing of the Community Mental Health Centers Act in 1963. It aimed to move people with mental disorders from institutionalization to community care. States were to receive federal funding to establish the care centers; that didn’t happen. Recently, federal funding cuts have forced states to make massive cuts; cutting funding for mental health care–seen in reduction of the number of psychiatric beds available–has further increased the problem of those needing care, some 60 percent of adults with mental disorders, simply not getting it. Part 2, Stigma Set In Stone, explores stigmatization of mental health and its consequences. In fact, the Medicaid law, written 50 years ago, was created with the idea that mental health care was “a black whole for money,” and that Congress didn’t want to waste money funding its care. Obamacare, much reviled, provides better coverage for mental illness due to its call for parity across all conditions, but those least able to afford insurance rely on Medicaid. So, the most vulnerable are forced to go without treatment. Imagine denying the indigent treatment for cancer, diabetes or any other serious or chronic condition. Part 3, Prisons Swamped, is perhaps the most angering of the three. In it, the result of defunding mental health care–police departments and the penal system picking up the slack–is explored. In Chicago’s Cook County jail, Sheriff Tom Dart, estimates 30 percent of the 12,000 inmates have a ” ‘serious’ mental illness.” He sites the case of one inmate, whose repeated arrests (100+) and detentions have cost the city more than $1 million. Across the country, police departments are increasingly coping with mental health issues leading to emergency calls from those with mental disorders as well as people living with them. The results include the tragic and the hope giving. Not everything covered in the series is dismal. There are a number of examples of individuals and organizations working to improve mental health care, including representatives who have introduced legislation targeted at specific aspects of the problem. I was less enthused about the use of “mental illness” to describe conditions which the medical community identifies as disorders. In fact, only the Director of the National Alliance on Mental Illness used the correct term: mental disorders. Perhaps a name change is in order for this influential organization. “The Cost of Not Caring” is billed as an ongoing series and one that can do much to highlight the dire state of mental health lack of care in the US. That USA Today is bold enough to state that we don’t care about such people is key to the series’ power.